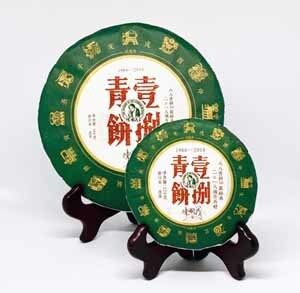 Tea Master Vesper Chan's 88 Qing Bing (88 Raw Cake) is recognized as an iconic tea cake in modern Pu-erh history. (For the story on the unique history of 88 Qing Bing, please click on this link). 30 years since the production of the 88 Qing Bing, the entire inventory of 30,000 cakes have been sold. To continue the legend of 88 Qing Bing, Master Chan created the 18 Qing Bing as it's worthy successor. 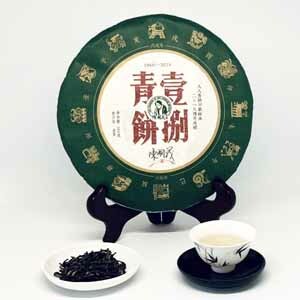 Produced from a blend of tea leaves personally selected by Master Chan from the Menghai and Lincang tea-producing regions, this tea is expected, like its predecessor, to have good aging potential. Unlike other raw Pu-erh with more floral notes, this tea is more woodsy in its tasted, with smoke and tobacco as its most prominent flavors. Its hui gan (cooling sensation) is quick in its onset and yet lasting.